Set in France during the Napoleonic Wars, this is the first volume in a trilogy telling the story of a regiment of Napoleon's soldiers recruited from the dungeons of the Bastille. Thrown together under the leadership of the ambitious Cezar, they are pronounced expendable. This is the first of six books which follow the fortunes of Alain Lausard across the Napoleonic Age in war.The books are well crafted, but not inspired on on individual basis. Still, they each tell a good story in a competent manner. The true worth of the books, however, are revealed in their totality.The device of one central character across the entire expanse Napoleonic Wars provides a variety of writing efficiencies in character development and it allows the author time to reveal the events in the background and the plotting in the foreground. Following the progress of Lausard from his jail cell to the Legion of Honor at Jena, and on to further spiritual growth through the tragedy of Eylau, many conflicts arise that are very exciting for the Napoleonic reader.Will Lausard, for instance, be reconciled to the humiliation of of the Revolution?Will he rise on his merits?Will he improbably be one of the few to survive all the major battles and campaigns?What fates will keep him alive?Will he rise to Marshal of France?We he become whole and will he provide a human example of the historical transformations of the age? These looming questions are wonderful sources of reading interest and it all unfolds in a competent retelling of the famous anecdotes of the era and the great human achievements of the age. Any one of the books is far less valuable alone than as a part in of the ensemble. In the totality of the work can be found a real value, wherein it it is clear the whole is far more valuable than the sum of the parts. The protagonist Lausard has many internal conflicts and rises in the Army as a dragoon despite his disdain for rank and glory. He grows and survives as his true intelligence and character constantly redeem him in the crisis of the outward conflicts around him. He rises to Sergeant and is widely respected by his fellow soldiers because he fights for them and not for glory itself. The road map of major events follows the obvious Napoleonic cannon. This first volume culminates on the "fertile plains" of Italy as the French transform from a band of misfits into a force worthy at the Battle of Rivoli to cause the Holy Roman Empire to begin its retreat into history. It is up to the reader to know what is generally going on. I recommend, as always, a syntopical reading with more a sweeping, factual telling of the campaigns from the strategic perspectives.This book and its companions are a valuable addition to the literature. However, I do not think the real dramatic interest can be obtained and enjoyed without a grasp of the ultimate context and major figures. You have to already know the big picture to get the marrow. This is quite possibly the worst series of military fiction that I have ever read!...The author betrays a knowledge of history and strategy clearly gleaned from Britannica Junior, his grasp of tactics is vague at best, and his capacity to develop characters (not to mention theme) ranks with my former 7th Grade creative writing class...Howard ineptly attempts to copy the genre of Cornwell, but without the slightest effort to make himself the master of historical detail apart from superficial (and generally wrong) references to technical terms...Napoleon is an arch-villain, endlessly playing the incarnation of evil with a God complex...The main characters are cavalrymen of superhuman skill who nonetheless petulantly argue the IDENTICAL exchange of dialogue for two pages of every ten (or more often) throughout the entire series!...One fellow has unshakeable idealism, another has religious faith (both are portrayed as buffoons for this), and the protagonist is a murdering cynic who condemns his fellows, the Revolution, the Directory, Napoleon, and every ounce of human existence, but to no visible purpose or eventual growth...This may seem like a overly-tedious exercise in sharing the author's hostility for (and ignorance of) the Age he selected for his work, but Howard does break the monotony with an occasional, and absurdly gory, fight scene...The battles are more dubious than the worst efforts of Robert Ludlum...Our heroes routinely stab various unmounted enemies in various ways three or four times while galloping past them, and the mounted enemies must submit to having their heads grabbed and necks twisted to breaking (of course, all done at the full gallop once again! )...I most wholeheartedly suggest that you turn your attention to Allan Mallinson (or even Delderfield) for a competent plot and skillful writing...I bought this entire series in great anticipation, and it brought me frustration, rage, and (by the third book) merely laughter...The series is not fit for a comic book. An entertaing and imaginative Napoleonic tale. 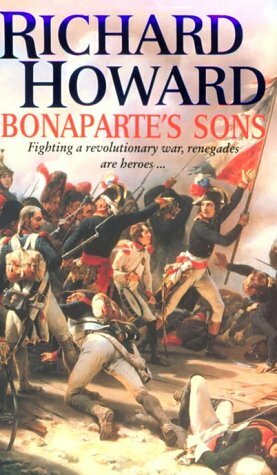 Fans of Bernard Cornwell's "Sharpe" series will undoubtedly enjoy Richard Howard's "Bonaparte's Sons". 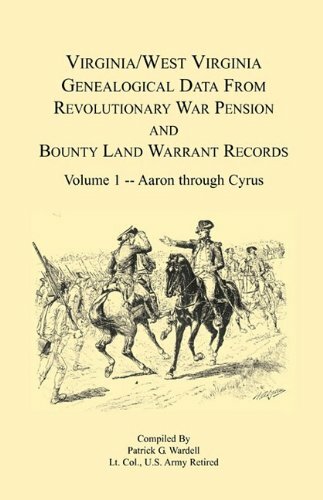 The novel follows the adventures of Alain Laussard, a disgraced nobleman rotting in the depths of a Parisian prison after the tumultous period following the French Revolution.Laussard, along with a mixed bag of fellow convicts is then recruited into one of Bonapartes elite cavalry units, and sent to the front lines of the 1797 Italian campaign. While the novel itself lacks the stylistic flair of Cornwell or C.S Forrester, it remains an enjoyable work. Readers however, should be prepared for cliched one-dimensional characters (even in the case of the main protagonist), and a fairly routine military story.That being said, the novel contains plenty of action, and a relatively impressive attention to historical detail (though at times Howards research becomes a little too evident, for example do we really need to know the precise speed of a projected cannon ball?). As a writer Howard is not quite in the same league as O'Brian, Forrester or Cornwell, but fans of Napoleonic war literature will definetly enjoy this novel as an entertaining and imaginative read. 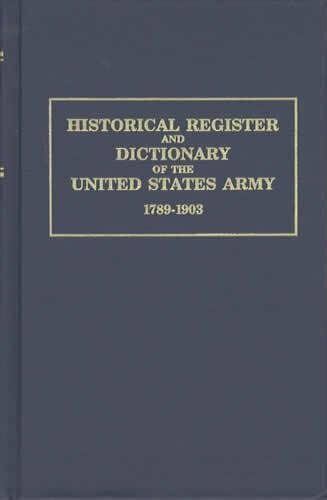 A comprehensive history or rebellions and U.S. invasions in Upper Canada, in 1837 and 1838, covering the skirmishes in eastern Ontario, Toronto, and southwestern Ontario. 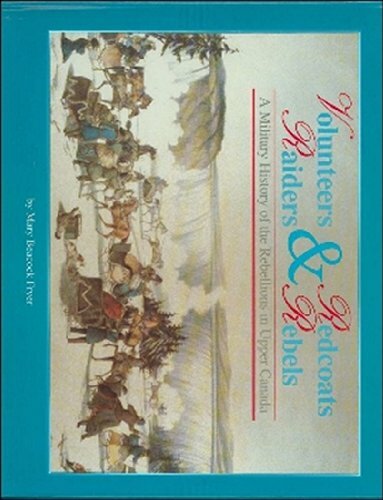 Lavishly illustrated with rare photos and maps, Volunteers is a popular narrative history that examines the lives and motives of the leaders of Upper Canada's rebellions; their U.S. allies; the British and Canadian administrators who played significant roles in the uprisings; and the Canadians who remained loyal to the Crown. 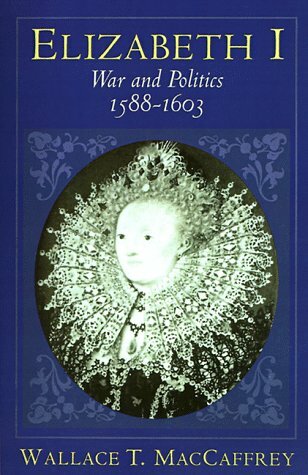 The book is also a careful and gripping study of the emotions and motives that burned inside of the men who led the rebellions; from Windsor in the west to Prescott in the east. 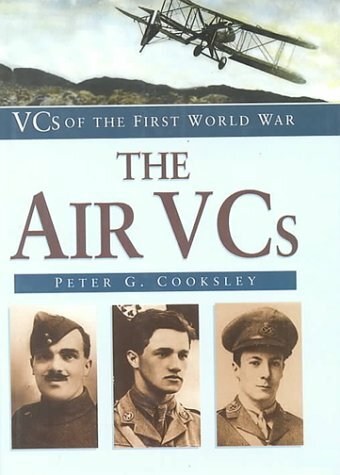 A co-publishing venture with the Canadian War Museum, Volunteers is being released in conjuction with the sesquicentennial of the famour Mackenzie rebellion in Toronto. Superb volume; spent happy hours reading about places we've been lucky enough to visit and reviewing ones still to come if we can ever cross the Atlantic again. Amazon is a fantastic storehouse for books on our favourite subjects.This one is a must as an aide memoire and a forward planner. This little book (only 126 pages) does many different things, all very well, and most better than books many times its size. 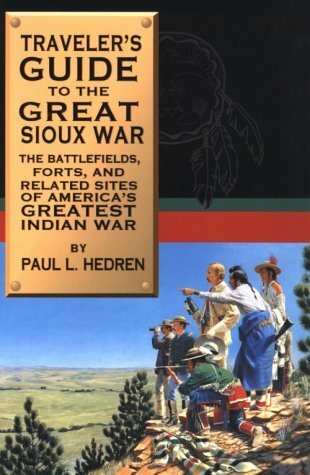 Hedren has chosen 54 specific historical sites relating to the Great Sioux War and arranged them chronologically, with site 1 being the Grattan Battlefield in Wyoming (commemorating an 1854 incident which helped set the stage for later events) and site 54 being Sitting Bull's grave in South Dakota (he died in 1890). In addition to these 54 "official" sites, Hedren identifies and directs readers to many other related locations nearby. Each site gets a number (which is also pin-pointed on a map), a brief description of the its significance, and directions to it (also whether it's on private property or not); then follows a longer historical account of the site's role in the War and a number of photographs indicating what a visitor to the site would see. It's a magnificent tool for anyone touring the area (most sites are in Wyoming, Montana, South Dakota, and Nebraska), but it's just as valuable (and exciting) for anyone interested in the Sioux War who can't leave his livingroom. A great book. Highly recommended. I wanted very much to give this five stars, but "minor" factual errors caused me to doubt the whole. I wanted very much to give this five stars, but "minor" factual errors caused me to doubt the whole. The biggest error I saw was about Lewis L. Millett. "In 1960, he started the U.S. Army Rangers"(p.133).I was also amazed to find out that a K-bar knife has a ten inch blade. These are just a couple of things that jumped out at me. Military readers have a keen eye for detail, and glorious deeds may be doubted due to sloppy editing and poor fact checking. I suspect that this book is basically true, but don't make me work at it. Revise and republish. I read this book for a graduate seminar on Ethics.Many soldiers who have acted courageously and survived their ordeal, have either not been very forthcoming in communicating their courageous acts or had a difficult time explaining what motivated them to risk their lives.However Kent DeLong, who at the time of writing his book War Heroes, was the attending physician of the Congressional Medal of Honor Society, conducted personal interviews with a few MOH recipients.One case in particular is the courageous actions of Major Patrick Henry Brady; a helicopter air ambulance pilot during the Vietnam War.When reflecting on his experience Brady said, "You don't think about the danger as much as you think about helping men who need you.In Vietnam, I was faced with a series of obstacles: enemy fire, terrain, or aircraft limitations.I worked my way through those obstacles and brought human beings to safety. "Brady's quote sounds like a good definition of Aristotelian virtue ethics about courage.When one reads the myriad of MOH citations, one quickly finds that the vast majority of soldiers recognized by their nation to have acted courageously did so out of friendship and love of their comrades in arms.Thus, Aristotle believes that a soldier is not acting courageously when he is reacting to danger with a thoughtless or blind act of emotional anger or revenge. I recommend this work to anyone interested in philosophy, and ethics. If you have an interest in history, and most especially these amazing men who put so much on the line for thier friends and country. This is the book for you. 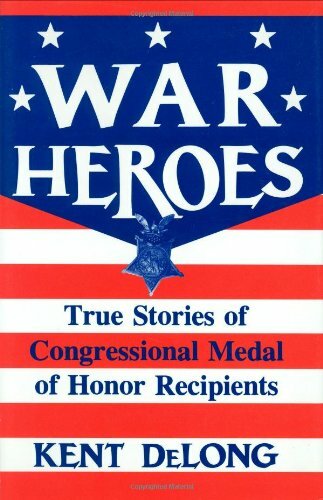 Facinating detailed stories of what these men did to recieve thier awards. I just wish we in this country were a little more careful about how we use the word hero. Because after you read this book, it will be hard to think of a basketball player, or movie star as hero. Volume One primarily focuses on the years from 1845 toJune, 1861. To the citizens of northeast Ohio the issues of slaveryand secession directly threatened their economy, their way of life,their commerce, and certain aspects of their liberty. 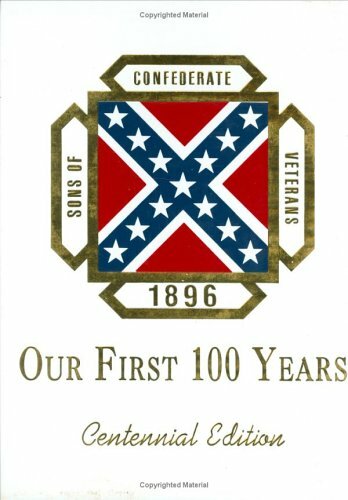 These heatedpolitical issues, the stances taken by the influential local people,and the family circumstances in young Ephraim Cooper's environment ledhim to immediately volunteer to help save the Union. Amidst theuncertainty for the future and the excitement of the present, Cooperjoined the Tyler Guards, an outfit that became Company G in the threemonths' service of the 7th Ohio Volunteer wInfantry. Great story telling and local history! In The Lion's Pride, Edward J. Renehan, Jr. vividly portrays the grand idealism, heroic bravery, and reckless abandon that Theodore Roosevelt both embodied and bequeathed to his childrenand the tragic fulfillment of that legacy on the battlefields of World War I. Drawing upon a wealth of previously unavailable materials, including letters and unpublished memoirs, The Lion's Pride takes us inside what is surely the most extraordinary family ever to occupy the White House. Theodore Roosevelt believed deeply that those who had been blessed with wealth, influence, and education were duty bound to lead, evenperhaps especiallyif it meant risking their lives to preserve the ideals of democratic civilization. Teddy put his principles, and his life, to the test inSpanish American war, and raised his children to believe they could do no less. When America finally entered the "European conflict" in 1917, all four of his sons eagerly enlisted and used their influence not to avoid the front lines but to get there as quickly as possible. Their heroism in France and the Middle East matched their father's at San Juan Hill. All performed with selfless some said heedlesscourage: Two of the boys, Archie and Ted, Jr., were seriously wounded, and Quentin, the youngest, was killed in a dogfight with seven German planes. Thus, the war that Teddy had lobbied for so furiously brought home a grief that broke his heart. He was buried a few months after his youngest child. When Colonel Theodore Roosevelt led his Rough Riders up theSan Juan Ridge in 1898, it was one of the most daring exploits of theSpanish-American War. Colleagues would later report that, seeminglyoblivious to the threat of death, Roosevelt "was just reveling invictory and gore," collecting spent cartridges as souvenirs for hisfour sons while shells exploded around him. 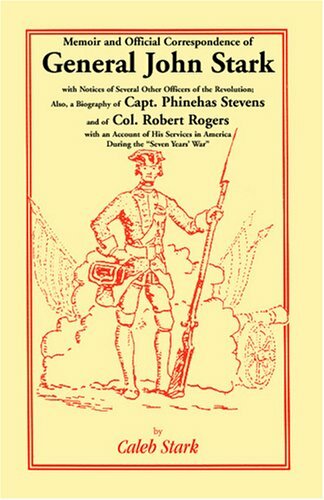 His martial vigor servedas a model to those sons, one that they took to heart, but their ownexperiences of war were far removed from TR's swashbucklingadventure. At the end of World War I, the youngest Roosevelt son--Quentin--wasdead, shot down in the skies over France. Theodore Jr. (Ted) andArchie both sustained serious injuries, and Archie suffered from boutsof serious depression many times in the years afterwards. Yet theyboth served, along with their brother, Kermit, in World War II aswell. At 57, Ted was the oldest American participant in the Normandyinvasion; Archie became the only U.S. soldier ever to be classified as100% disabled twice in his career. Theodore Roosevelt as a father. This is an excellent work about Theodore Roosevelt as a father. Although the author discusses his children throughout the book, the focus is on TR himself. One thing I have admired about President Roosevelt is that he loved being a father (although his relationship with his oldest daughter, Alice, was strained), and this drew me to read this book. I was not disappointed. The author also gives us a glimpse into TR's father, Theodore Roosevelt, Sr., who was a very generous man with his time and money. After reading about him, I understood why TR valued public service. Because the author focuses on the president, the reader will see how TR influenced his children to value public service. For example, all of his sons served in the military. Indeed, Quentin Roosevelt died as a pilot in a dogfight in World War I. The elder son, Theodore Roosevelt II, led the first wave on Utah Beach in Normandy on D-Day during World War II. He died of a heart attack some weeks later. Archie was declared 100% disabled in both World War I and World War II. Kermit also served well in both wars, but suffered from alcoholism and depression (TR's brother, who was Eleanor Roosevelt's father, also suffered from the same). Also, TR's youngest daughter, Ethel, served as a nurse in France in World War I. This book is definitely worth reading to get a view of Theodore Roosevelt as a family man. I wish we had more elected officials like him today. 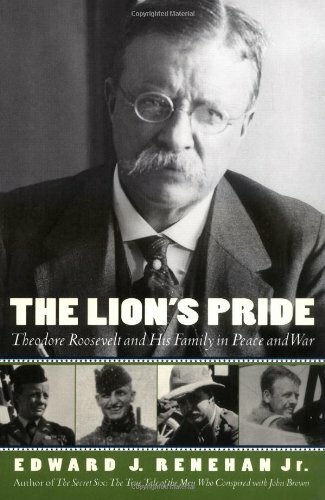 Completely understanding TR is impossible without considering his children, or his own childhood for that matter.These are the foci of the "The Lion's Pride: Theodore Roosevelt and His Family in Peace and War. "TR was deeply influenced by his father, a wealthy and generous, many would claim great man whose most glaring defect and regret was what amounted to a buy out of his Civil War service obligation.TR called him the "greatest man I ever knew. 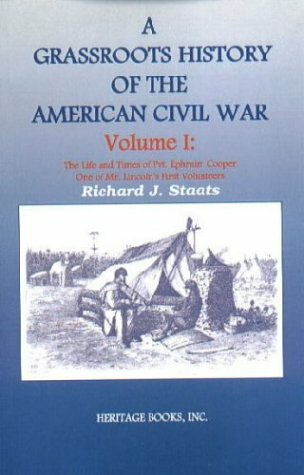 "Yet, in many respects TR spent the rest of his life attempting to overcome and reverse this blemish upon the family record through extraordinary patriotism and service.Leading at the apex of conflict and danger was the duty of a great and privileged family.This credo was embraced wholeheartedly by his children, which makes for fascinating reading. While some would argue this compulsion became excessive and detrimental, the Roosevelt's had no regrets and curiously embraced their family tragedies in the midst of great pain.This phenomenon is particularly evident in the death of the youngest, Quintin while flying patrol over German lines in WWI.On the other hand, if you are looking for an in depth look at any one or more of the children this book will not suffice.Indeed, the early chapters focus on TR's life leading up to WWI, while the latter chapters are largely dedicated to his offspring's activities in young adulthood, particularly those related to the Great War.There is little regarding TR's close and often tender relationship with his children during their childhood in the White House or at Sagamore Hill.As a result, while I greatly enjoyed this book, I was hoping for more breadth and insight into the children's upbringing and their lives after TR's death. 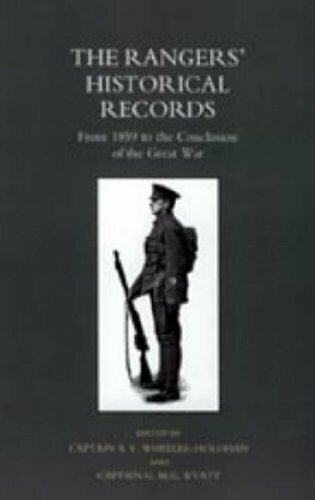 Renehan's accounting of the last years of Theodore Roosevelt Jr. is condensed and fascinating.Mostly covering 1898 and 1910-1919, the book provides insight into the southern New York high society of the early 20th century.Famous names, including Vanderbilt, Roosevelt, Cowles, and Coolidge, parade across the pages. Nuggets include the mention of Harvard in that time as a conservative and pro-military bastion (compared to today's institution fighting military recruitment in court), Woodrow Wilson viewed as an appeaser, a coward, and an appointer of bigots in his administration (in contrast to a reputation as being a visionary negotiator), observation by Gen. George Patton that Theodore's eldest son, Brig. Gen. Theodore Roosevelt III, was a courageous commander- but no soldier (both father and son won the Medal of Honor...a feat perhaps not matched by any other American family), and the contrast highlighted between Kaiser Wilhelm's non-combat patronage of his sons (during WWI) and the former president Roosevelt's sons participating in front line combat.Another interesting fact: three of Roosevelt's four sons died in military service--one killed in action, one dead of a heart attack a month after D-Day and one day before he was to be promoted to major general, and one a suicide).The fourth suffered from the long term effects of severe war wounds. Roosevelt is also revealed as a founding father of the original progressive movement...born out of the Republican party, no less. "Progressive" used to mean advocating sensible capitalism through the restraint of unlimited power of large corporations (through the Sherman Act) and the promotion of sound environmental policy and conservation.It also demanded the U.S. government uphold its main role--that of national defense.This is in stark contrast to today's "progressive" thinking--complete rejection of market economics and corporations, radical environmentalism, and pacifism.Roosevelt must spin in his grave. All in all a great primer of the former president.Makes you want to immediately run out andread more. 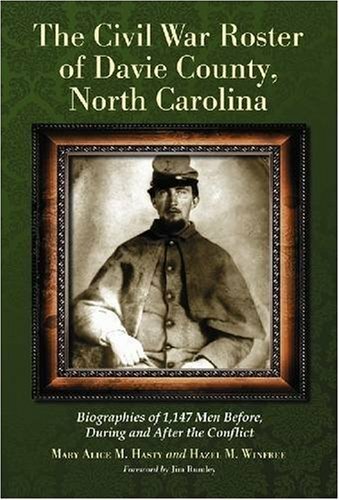 I read any book on TR.This one I was hoping would reveal more about his family.It still is a good read about TR. This is one of the best biographies of Theodore Roosevelt that I have ever read.It is interesting when you read this book and compare the legacy of the Roosevelt family and the Kennedy family.This is just my own opinion but I think the Roosevelt have more personality then all of the Kennedy family which is strange considering that the Roosevelt's are more overlooked. Roosevelt was in effect the first of the modern politicians but still elements of the old school. 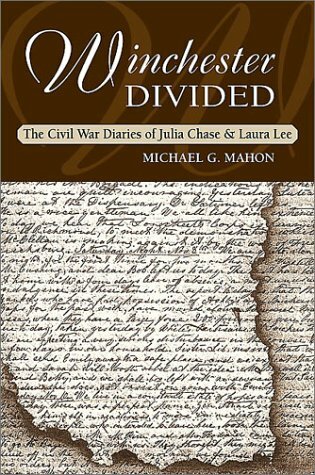 I'm both a Civil War buff, and a native of Winchester, Virginia.So, this book has special meaning to me. Winchester has always been careful to preserve its history.So, it's fun being able to read about the locations in this book and say, "Yeah, I know that house.It's still there." It also gives an excellent insight into how life was during the war, through the words of two young women who were on the scene. Its not the best - its the only one that does it! I commend Mr. Watford for his effort, but he seems to have gotten mixed up on his facts.My ancestor too, is misrepresented.Watford records him as having never married (something his numerous descendants find either vexing or humorous) and attending a college he did not attend.I think that data got garbled in his notes, and that the bio he gives probably connects to someone else.There's likely no demand, but a corrected second edition would keep a lot of family researchers from going off base. 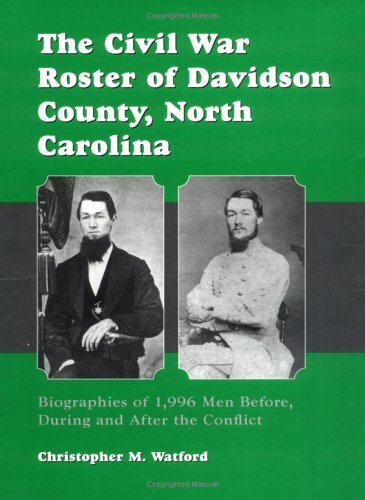 This book was very badly researched.Julius C. Loftin was my great grandfather.The author has part of the information correct, his birth place, his Civil War Record, the name of my great grandmother and where they were married.However, he listed his birthday wrong, ALL of his children wrong (I should know who my grandfather and father were! ), his death date wrong and the place that he died and is buried wrong. I contacted the publisher about this mistake and they said that they would pass the information on to the author.However, I have never heard a word from the publisher again or from the author. I was so livid with rage at this mistake that I did not bother with the rest of the book even though many of my ancestors were listed in it. 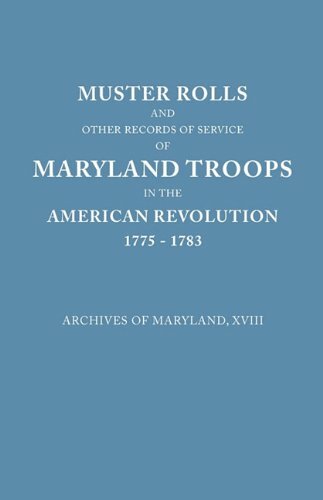 This is the standard on the more than 20,000 Maryland troops in the RevolutionaryWar, and as such it is a book of the greatest genealogical and historical magnitude.